Even with all the cooking I do, I still struggle with weeknight dinner recipes. I am always faced with the dilemma of choosing between something easy (and usually not so healthy) and something that is better for me but usually requires a little more work. 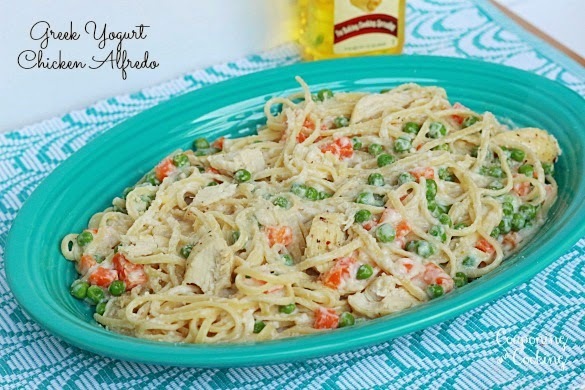 This Chicken Alfredo pasta is the perfect compromise. It tastes like something sinful but it has no cream, no butter and no cream cheese. It tastes like something you would be cheating with but only takes minutes to make. In my opinion that makes it the ideal Tuesday night dinner option. I love feeling like I am indulging myself without having to go crazy in the kitchen or feel like I am. The Greek yogurt gives it that creamy taste without all the fat and made it super filling too. 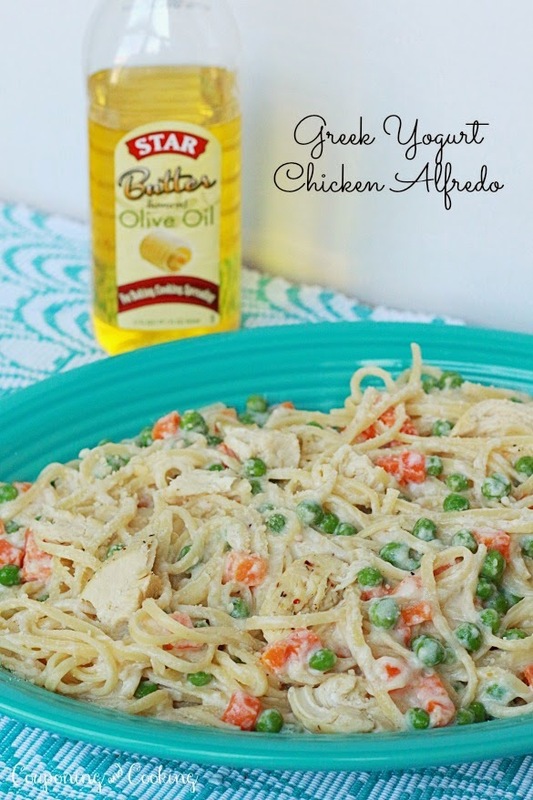 One of the key's to making this recipe taste so buttery without using actual butter is that I used Star Butter Flavored Olive Oil to saute my garlic and start my sauce. I could really taste the butter flavor throughout the whole dish even though I only used a tablespoon for the whole recipe. 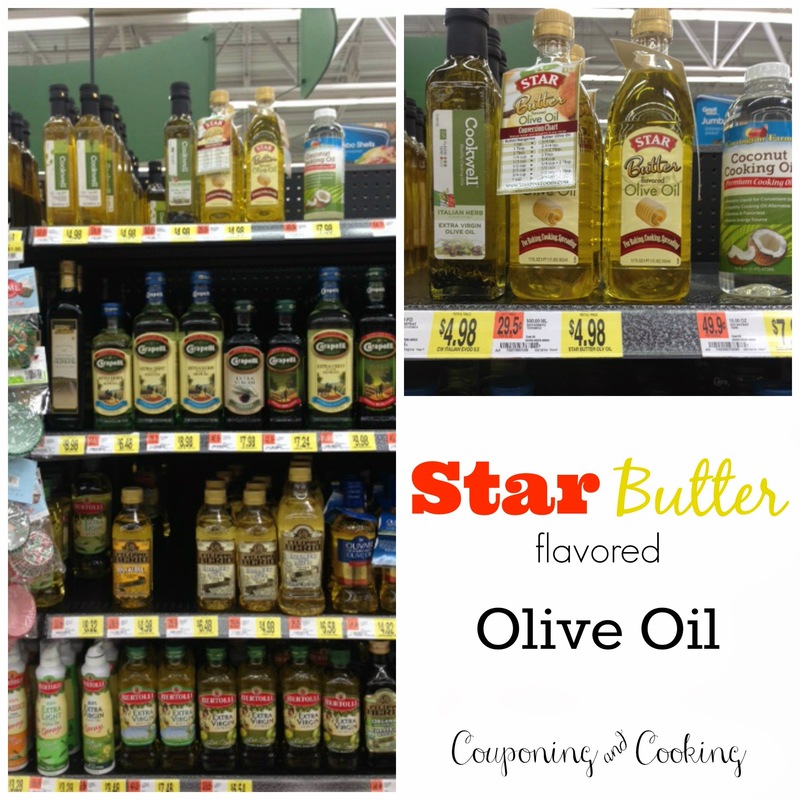 I always make sure that I grab a bottle when I am in Walmart since you can only find this flavor of Star Oil there. I love that you can prep parts of this recipe ahead of time as well. I baked up my chicken right when I got home and then sliced it up and stuck it in the fridge. You can also boil your pasta ahead of time and toss it in a little Star Oil to keep it from sticking while you make your sauce. 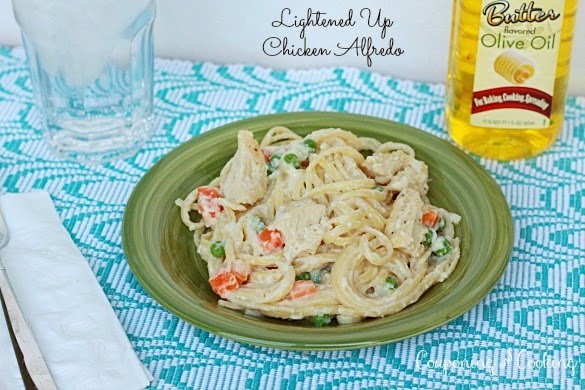 You could easily switch this recipe up by adding bacon or instead of chicken. I am not ashamed to admit that I ate it for dinner on Monday and for lunch the next day too. 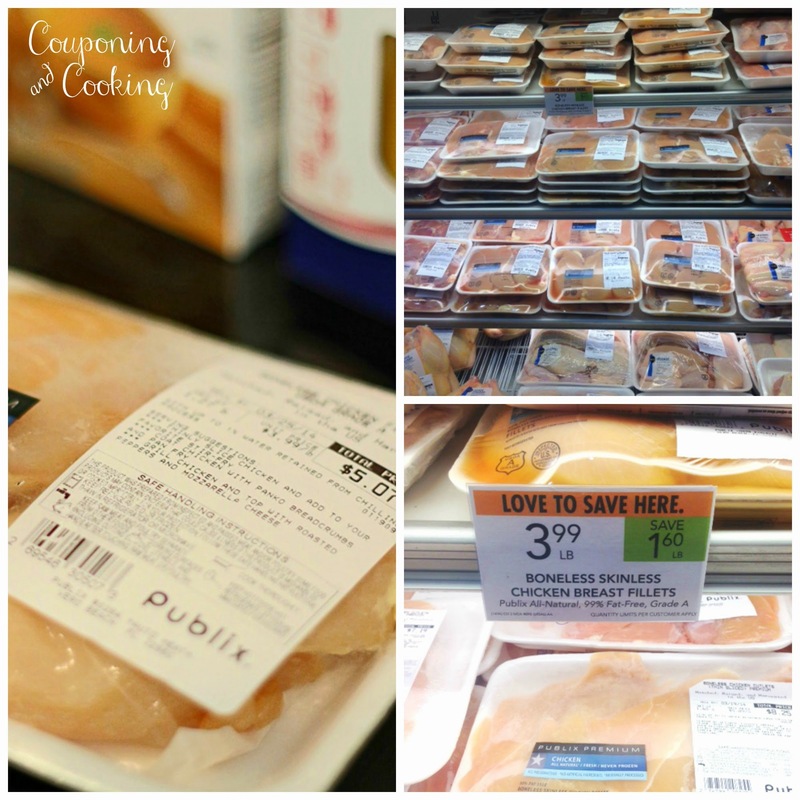 I was happy to see that Chicken was on sale at Publix this week so I grabbed some fresh boneless, skinless chicken breasts on my way home from work on Monday as well as a few other things I need for the recipe. 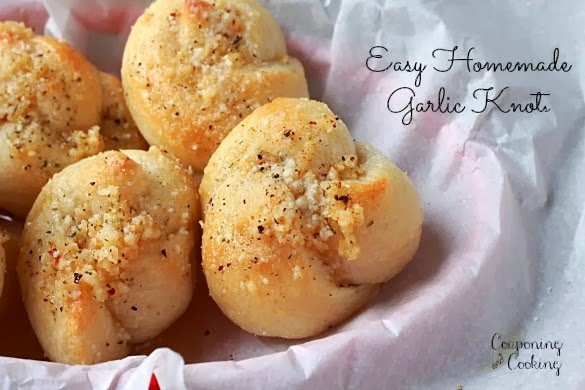 I also grabbed a can of bread stick dough so I could make a batch of these Quick & Easy Garlic Knots to pair with our pasta. We added a side salad to our pasta and knots and it felt like we were eating dinner at an Italian restaurant instead of at our kitchen table with House Hunters on in the background. 1.) Before starting your sauce, cook your pasta as directed on the package, strain, toss in a little bit of oil to keep from sticking and set aside. 2.) While the pasta is cooking, bake or grill your chicken in whatever way you prefer. I found that having it cooked and sliced ahead of time was easiest. 3.) In a large sauce pan, heat Star Butter Flavored Olive Oil and saute garlic in it for about 2 minutes. 4.) Stir in corn starch and nutmeg to make a rue. 5.) On medium heat, whisk in chicken broth and bring to a simmer. 6.) Stir in frozen peas and carrots and bring sauce back up to a simmer. 7.) Lower the heat and stir in the Parmesan cheese until melted. 8.) 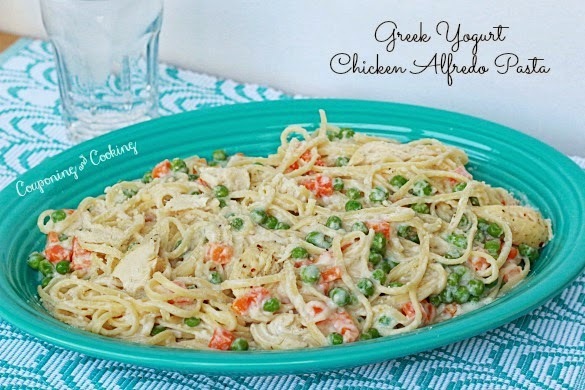 Right before serving, stir in the Greek yogurt and then toss the pasta and cooked chicken into the sauce. 9.) Best served right warm right after mixing in the yogurt. You can store left overs in the fridge and use a little oil or a little chicken broth to thin it out when reheating. Enjoy! Well Darn. 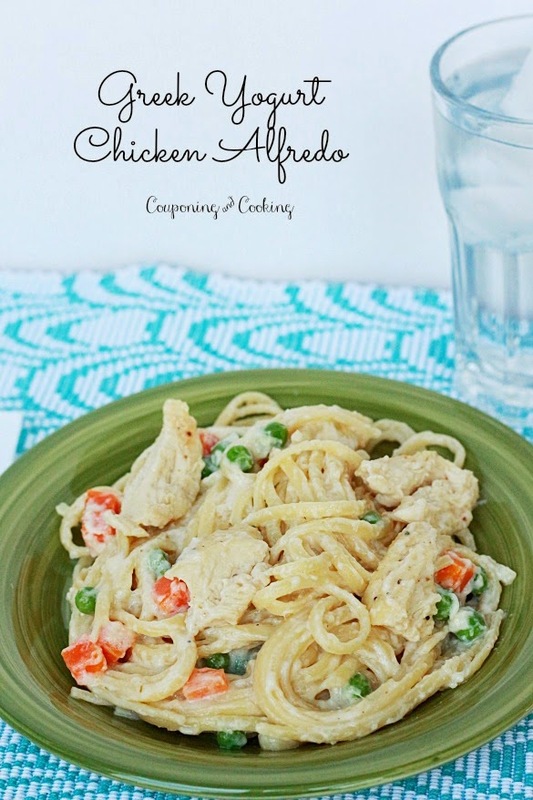 Saw this and got all excited to try it, because we both love Alfredo sauce. But while mine has just garlic, cream, and parm in it, this has the high carbs of corn starch and yogurt. just got diagnosed as pre-diabetic, and am discovering most "low calorie" meals are really replacing fats with carbs instead, as this one does. Darn. Gotta do with lowest carb, high fiber noodles to even think of eating Alfredo, or eat it with blanched veggies. Well, yours looks wonderful!